Why Stay at a B&B in Kolkata? 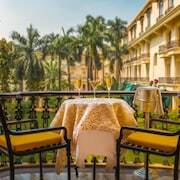 If you want to find a place to stay with fewer rooms than the traditional hotel and a more personalized environment, a bed and breakfast might be the perfect option for your vacation to Kolkata. You'll find 465 lodging options and 5 B&Bs for your trip to Kolkata. If you'd like to learn more about Kolkata through its top sites and landmarks, Victoria Memorial and Dakshineswar Kali Temple are some notable monuments to check out. When you want to spend some time in the great outdoors, Milennium Park and Chandpal Ghat are some notable spots. You might put Victoria Memorial and Eden Gardens on your list if you want to see more of the area. Nearby metro stations include Central Station, Chandni Chowk Station, and Esplanade Station. If you want to see more of the area, hop aboard a train from Kolkata Sealdah Station, Kolkata BBD Bagh Station, or Kolkata Eden Gardens Station.